Posted on December 10, 2017 December 9, 2017 by SherylPosted in FoodTagged candy, recipe. It’s nice to hear that this post reminded you of a favorite family recipe. I haven’t had this since probably the late 1960s. Mom used to make it all the time. 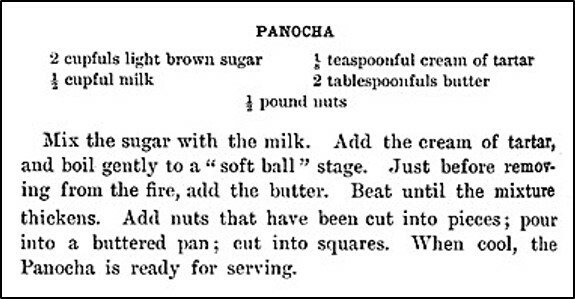 I just pulled out her recipe and saw that she spelled it “penuche.” It’s a different spelling, but I’ll bet it’s the same great taste. The recipes are almost exactly the same, too. Like chocolate fudge, it’s not complicated. That is what my Mom called it too and I never thought I’d find a recipe for it! It’s nice to hear that this is a recipe you were looking for. There must be several different spellings. I struggled to spell this candy the way it was spelled in the old recipe. Every time I typed it, I automatically spelled it the way your mother did – and then had to go back and correct it. I had some once, but never saw a recipe. I printed it right away. It’s wonderful to hear that you printed it off. I think that you’ll like this recipe. Do you have to put in the nuts? Will it make a quality difference? I think that you could skip the nuts without any change in quality. However, you may need put the fudge in a smaller pan. The additional of the walnuts definitely increased the volume of the mixture. Good to know! We’re going to be making candy this weekend and I was going to try this – we have all the ingredients, save the nuts. Great find. This looks so tasty! I’ve seen several candy recipes recently and this one reminded me I need to get a new thermometer and get started! Looks delicious and not too hard – thank you! One of my children got me a new thermometer for my birthday – and it really helps to have a good thermometer. Until I started having problems with my old thermometer, I hadn’t realized that thermometers can lose their calibration over time. I have a recipe for this that calls for pecans instead of walnuts. Now I am debating whether or not I should concentrate my efforts on making cookies or candy for Christmas. My great-grandma has fantastic recipes for both. Pecans would work well in this recipe. The hundred-year-old recipe just said “nuts.” I used walnuts when I made the recipe, and that is what I listed in the ingredients section of the updated recipe – but maybe I over-interpreted the old recipe and should have just listed “nuts” when I updated it. You’re welcome. It’s wonderful to hear that you like this type of fudge. I love it! .. my guilty pleasure…I use raw coconut sugar do you think that will be ok in this recipe? Hmm. . . I don’t know. I’m not familiar with raw coconut sugar (though it sounds delicious). Can it generally be substituted for brown sugar? The Panocha definitely has a bit of the caramel flavor that comes from the brown sugar. I might try it… is is light brown in colour as it is raw and not bleached but more like demerera texture not fine like brown sugar but it should melt…. If you try it, you’ll have to let me know how it turns out. It sounds good. Oh yum what a great find. Hmmm…are these calorie free? 😁 they look delicious! My grandmother used to make this, I couldn’t find the recipe and I think she just had it in her head (most of the things she made were never written down). It would show up with almost any kind of nuts in it, cashews, pistachios, pecans, walnuts, peanuts, sunflower seeds, and one year with sesame seeds so I think the “nuts” was to indicate whatever was on hand. I WILL be making this as soon as possible. Thanks for the information. The options you describe sound wonderful and make me want to make the recipe again so I can try putting another kind of nuts in it. One of my favorite things about old recipes is how simple and flexible they are. Most recipes only have a few ingredients and were easy for cooks to keep in their heads – and they could make adjustments based on what foods were available. Another sweet find. Simple and delicious. I like how (when compared to many modern recipes) most old recipes are simple. 🙂 It’s nice to hear that you enjoyed this post. 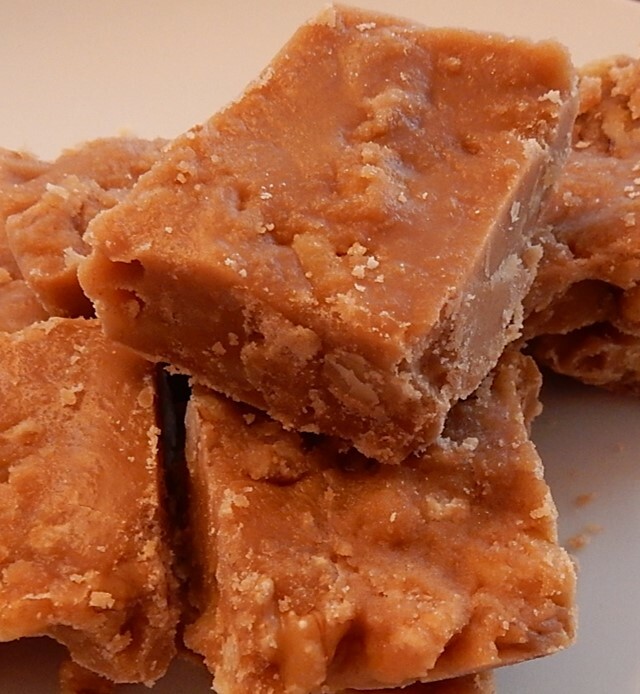 Penuche is my absolute favorite fudge! (with and without nuts). I make it every year at Christmas…. I may need to make it twice, now and for Christmas! 🙂 It is a tasty fudge. That does look easy to make! Certainly easier that traditional fudge, and probably more interesting too. I like trying non-chocolate fudges. There are so many interesting varieties. Looks good. My mom never used a candy thermometer and taught us how to test the soft ball/hard ball stage but I did not master the technique. I must admit that I use both a thermometer and the soft ball/hard ball method. Somehow I feel more confident that the candy is ready to remove from the heat if I double check the temperature using two methods. I can understand that thinking. That looks delicious! It would make a nice gluten free treat, too! I like how this recipe is both easy and tasty. Oh wow, this looks so yummy, thanks for sharing!